Hey everyone, happy Easter . I just wanted to share this project that I spent almost all day working on. When it comes to decorating Easter eggs, I like to go all out. This is definitely the best Easter egg creation that I have ever made and I'm very happy with how it turned out. I would have drawn some amps and stage decorations, but by the time I was finished I just wanted to leave it as is. I hope you like it, have a great Easter if you celebrate it. Rush on! Neil's little hat is the cat's pajamas! Awesome. I saw the work in progress on twitter but never saw the completed set. Thanks for uploading it. That is awesome. 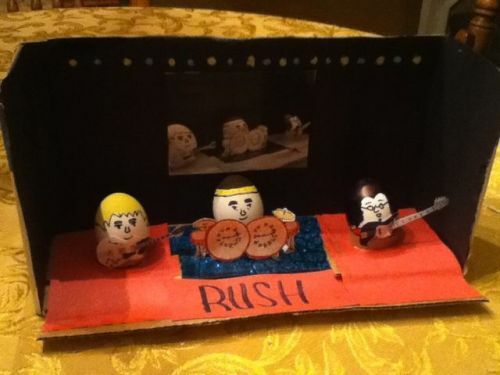 Looking forward to your Rush onstage Nativity scene in December! They *are* the holy triumvirate, after all! Happy Easter and thanks for sharing this super cool picture. That's funny. Thanks for the much needed laugh. That's wonderful, and what a magnificent centerpiece it would make on any table! It's missing the Clockwork Angels string section, however. Absolutely wonderful !!! Is it possible to order anything Xmas related? Edited by geezer, 03 April 2015 - 12:29 AM.